This is a simple, fruity wine but structured and refreshing—a good value. Black cherry with vanilla and nutmeg on the nose, it lacks complexity but makes up for that with clarity and focus. Very gentle oak. In the mouth, the hint of sweetness is a bit too much to be a quality Pinot Noir but racy acidity and firm tannins give this wine great energy and backbone to complement the soft, lush texture. Almost all Pinots in this price range emphasize sweet fruit. This is head and shoulders above most of them. 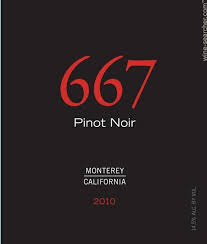 The 667 in the name refers to the particular Dijon clone that makes up the bulk of this wine. Noble Vines is part of the Delicato group who also bring you Gnarly Head among other brands.